If you are looking for a job that gives you the opportunity to travel and work across the world, the chance to meet an interesting and diverse set of people from a range of backgrounds, cultures and religions, and a job that is not only flexible but also challenging and rewarding, then TEFL (Teaching English as a Foreign Language) may be the right job for you. Are you eligible? Find out with our TEFL Eligibility Test. Take a CELTA or Trinity TESOL (the two internationally recognised English teacher training qualifications) with Cactus in one of our most popular locations and get a massive 10% off your tuition fees*. Cactus only works with high quality, accredited institutions. Simply quote code TEFL10 when enquiring to Cactus TEFL and booking your course. *Total fees include the tuition plus the exam fee. The discount will be applied to the tuition fees only. Average exam fee is £150. Don’t forget to check our TEFL Jobs page to check all the up-to-date opportunities from all over the world. Brighton, UK: 12- week Trinity CertTESOL only £795 if you book with Cactus ONLY! Jenny is 37, from Nottingham, UK and currently teaches in Hanoi. If you are considering a career, either long-term or short-term, in English language teaching then the first step is to take a CELTA or Trinity TESOL course. These are the two main internationally recognised courses for English language teaching and will enable you to apply for English teaching jobs anywhere in the world. Courses are either 4 weeks full-time or 12 weeks part-time. 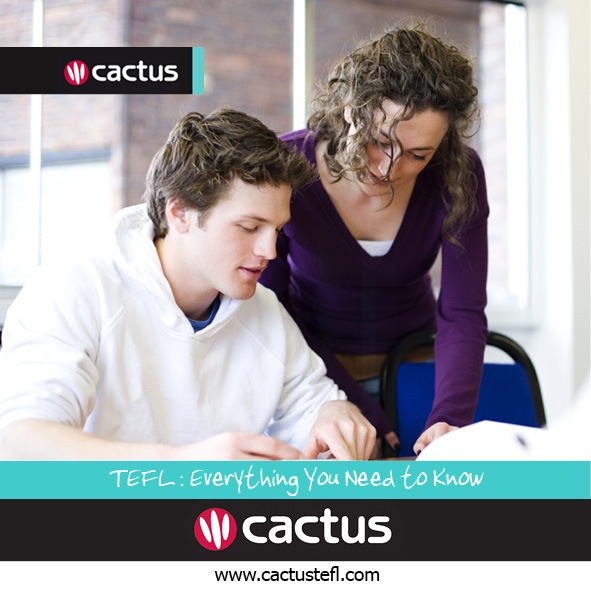 Cactus TEFL also offers online TEFL courses which can be taken anywhere in the world. Cactus TEFL has a wide range of CELTA and Trinity TESOL courses on offer around the world, all courses linked on this page can be booked with a massive 10% discount. So why not take advantage of this great offer (you will not find these prices anywhere else) and start your journey towards your dream job! For all your English teaching and TEFL related questions simply contact us, or call us, one of our multilingual team will be happy to answer any questions you may have.